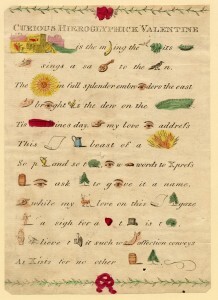 This year’s collaborative Pinterest project between the John Johnson Collection and the National Valentine Collectors Association (USA) focuses on the proclamation of love in rebuses, knots and puzzles. These all have their roots in much earlier forms, and mark a convergence of German, Pennsylvanian and British traditions. 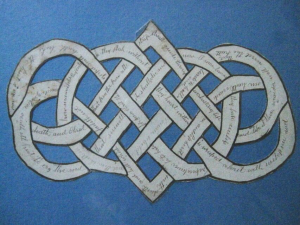 In The valentine and its origins, Frank Staff shows examples of a rebus and of an endless knot from from Witts Recreations selected from the finest fancies of modern muses (London, 1641). He also demonstrates clearly the link between the German tradition of Freundschaftkarten (literally friendship card) and Irrgarten (labyrinth) and the Pennsylvanian Fraktur, puzzle purses and love knots. The rebuses we show on our Pinterest page date mainly from the 18th and early 19th centuries, with some later, simpler, examples. These valentine rebuses are part of a much wider tradition. In the John Johnson Collection there is a fascinating folder of Hieroglyphic letters from the same period on subjects (mostly) other than love. These are similar to the examples in the Mercurius Politicus blog. We thought it would be fun for you to try some and will be posting these on Twitter too. Puzzle purses differ from other mechanical valentines in their elaborate folds. Not only did the recipient have to work out in what order the message should be read, but re-folding the puzzle purse was no easy matter! The folds were numbered and revealed poems and (carefully enclosed in the centre) often a lock of hair or a ring. 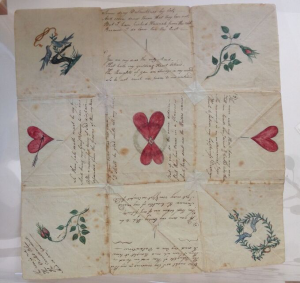 Nancy Rosin, President of the National Valentine Collectors Association, has a wonderful article about the mechanics of these online in her Victorian Treasury. Symbolic of never ending love, Endless knots or True-love knots, on the other hand, can be read in any order. 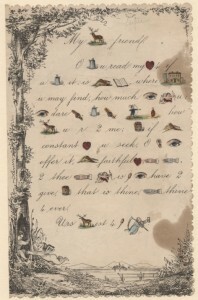 These sometimes took the form of cut-out work, or could be incorporated into the design of more elaborate valentines. Do you have examples of any of these? If so, please send images to jjcoll@bodleian.ox.ac.uk and we can pin them.